When your digestive system is running smoothly, you tend not to think about it. Once trouble begins, your gut — like a squeaky wheel — suddenly demands your attention. 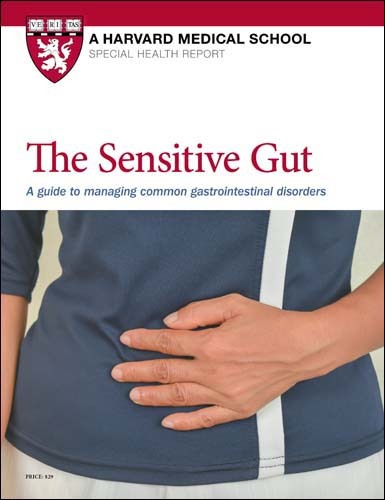 This Special Health Report, The Sensitive Gut, covers the major sources of gastrointestinal distress: irritable bowel syndrome, gastric reflux, upset stomach, constipation, diarrhea, and excess gas. It also includes a special Bonus Section describing how emotional stress and anxiety can cause gastrointestinal distress. Your “gut” is the series of organs — mouth, esophagus, stomach, small intestine, and colon — that transform the food you eat into the nutrients your body needs to live and to thrive. If you’ve ever had an upset stomach, constipation, heartburn or gas, you know how sensitive the gut can be. These “gut reactions” can be painful, disruptive, and sometimes embarrassing. Fortunately, you can do something about almost all gastrointestinal disorders and achieve a calmer, quieter coexistence with your digestive system. You can address, prevent, and treat the most common troublemakers, including acid reflux, functional dyspepsia, irritable bowel syndrome, constipation, diarrhea, and excessive gas. This report gives you strategies to prevent and treat heartburn, which is the key symptom of gastroesophageal reflux disease (GERD) and the most common gastrointestinal malady. You’ll discover which pain relievers — from Prilosec and Nexium to Zantac and Tums — are the safest and fastest-acting remedies. You’ll be alerted to six diseases that can mimic the symptoms of irritable bowel syndrome (IBS), be briefed on new diagnostic tests and find ways to eliminate the triggers and manage this vexing condition. In The Sensitive Gut, you will gain an empowering understanding of your digestive system, how it works, and what you can do when it acts up. The report explains the brain-gut connection and the effect stress can have on your digestive system. It shares the best ways to treat constipation without laxatives, tells you how simple mealtime changes can spare you from indigestion without forgoing the foods you love, and much more. 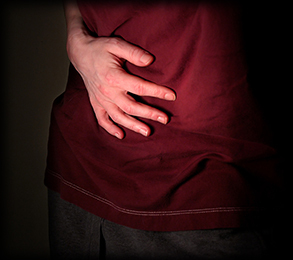 Frequency of bowel movements: What’s normal? Stress-related symptoms in the GI tract vary greatly from one patient to the next, and treatment can vary as well. For example, one person with GERD might describe an occasional, mild burning sensation in the chest, while another complains of excruciating discomfort night after night. As the severity of symptoms varies, so should the therapies, medications, self-help strategies, or even surgeries used to relieve them. Many patients have mild symptoms that respond quickly to changes in diet or medications. If symptoms do not improve, your clinician may ask you more questions about your medical history and perform some diagnostic tests to rule out a physical abnormality, infection, or cancer. For some people, symptoms improve as soon as a serious diagnosis has been ruled out (another example of how emotional stress affects the gut!). Your doctor may also recommend symptom-specific medications. But sometimes these treatments are not enough. As symptoms become more severe, so does the likelihood that a patient is experiencing some sort of psychological distress. Often, patients with moderate to severe symptoms, particularly those whose symptoms arise from stressful circumstances, stand to benefit from psychological treatments such as cognitive behavioral therapy, relaxation techniques, and hypnosis. Some patients are reluctant to accept the role of psychosocial factors in their illness. But it’s important to know that emotions cause real, chemical and physical responses in the body that can result in pain and discomfort. Behavioral therapy and stress reduction treatments do not directly reduce pain or improve symptoms in the way that drugs do. Rather, the goal is to reduce anxiety, encourage healthy behaviors, and help patients cope with the pain and discomfort of their condition.